.....what the heck does the Queen carry in that purse? Like today....she carried this cute number to her grandson's wedding. 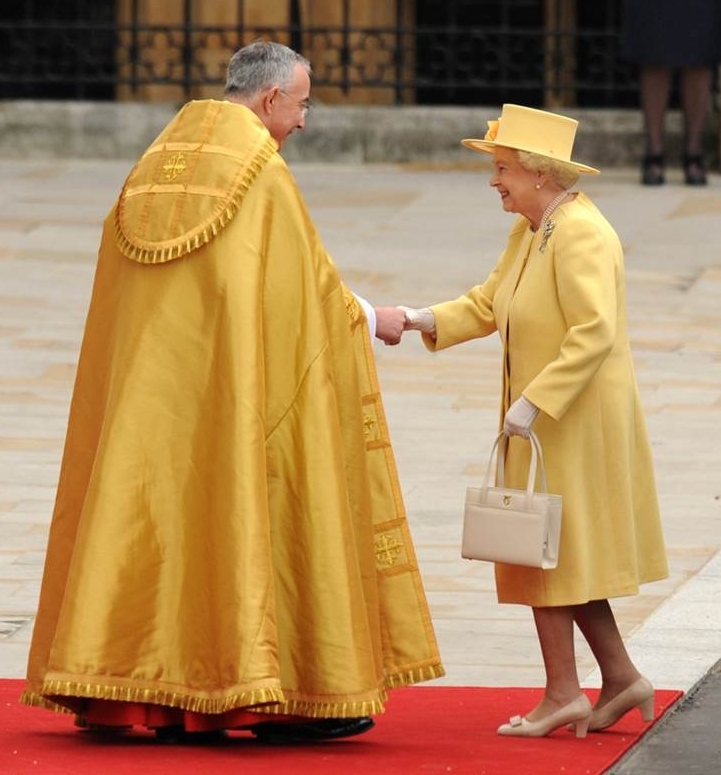 She went straight from Buckingham Palace to Westminster Abbey. Then she went straight home. She didn't drive, and if she needed a hankie she could have tucked one up her sleeve or on her bra. So, Grandma J decided to put an end to all the speculation. Especially since no one gives a dang but her. 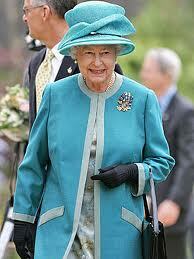 Here is some trivia she found about the contents of the Queen's purse. **"Enquiring minds want to know: just what does Queen Elizabeth carry in that purse? As it turns out, there is more to the royal purse than its meager contents. It doubles as a signal device. 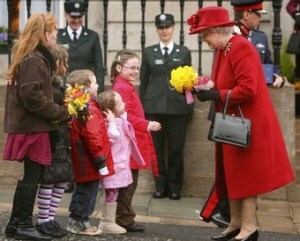 When the Queen is carrying out her royal duties at some function, she uses her purse to communicate with her servants. When she shifts the bag from one arm to another, for instance, it means she’s ready to leave. When at a banquet, if the Queen sets her purse on the floor, it’s another bad sign. She finds the conversation boring and wants to escape. 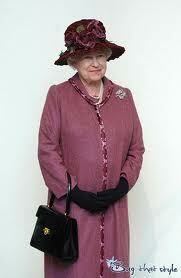 However, if the royal bag dangles happily from the crook of her left arm, she is happy and relaxed." "One thing that can always be found inside the Queen's purse is an S-shaped metal meat hook that she can place on the edge of a piece of furniture and hang her purse on it." Grandma J bought one once at the Dollar Tree. 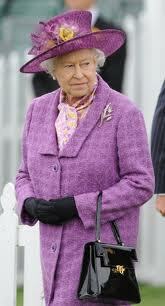 "She always carries a metal make-up case given to her by Prince Philip as a wedding gift. She carries a collection of good luck charms, most of them gifts from her children, including dogs, horses, saddles, and horsewhips, reports the Daily Express, and photos of her children. She is never without her mints, chocolate drops for her corgi dogs, and a crossword or two snipped from the papers by her attendants." **Majesty magazine reports that the Queen carries a comb, a handkerchief, a small gold compact and a tube of lipstick in her handbag. On Sundays, she carries paper money to place in the collection plate at church. And when you dis Fergie, she gets even and dresses her girls funny. Those hats on Fergie's girls were something else. Do you think they liked them and thought they were pretty? I was intrigued! I always liked Fergie. Someday I want you to tell me the story of It's a wonderful world, ok? I actually saw Queen Elizabeth twice when I was in Australia many years ago. Once up really close. Can't remember what kind of purse she carried, but both hats were horrific! It was a very interesting experience sort of running into her. 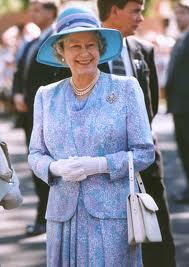 Growing up we had a neighbor lady who always had her purse on her arm just like the Queen. We always wondered what was in that purse!!! I heard a fashion expert say that Princess Ann looked like "cole slaw!!!" Fergie's girls should get an award for being able to get out of the car with those hats on!!!!! ...and her flask! You forgot the most important content of her bag. And forget needing a place to put a hankie...that woman shows no emotion...or she would have been crying at the sight of those hats!!! Romper Room....Grandma J you are joggin' my memory...my niece was on Romper Room with her pre-school...and her mom, my sister was on Sheriff John! I use my purse as a signal too. When I am angry, I hit people with it. Do you think they have a dollar tree in the UK? You and I think alike...I know; scary. I always thought she was packing heat in the bag - LOL! "....gifts from her children, including dogs, horses, saddles, and horsewhips,"
Yes..I've always wanted to carry a horsewhip around with me, too-and I carry around the size purse that would hold a life-sized one. The reason on shoulder is higher than the other, I guess, but I'll not be caught without the kitchen sink in mine. Must go look up "horsewhips for purses." I just assumed it was feminine supplies. Well thanks for clearing that up! I have no idea what all is in my purse! And those hats...I am speechless!